Well, I got to try out the new Kayak on Saturday and it did not disappoint. I had a good time on Lower Genesee Lake in Western Waukesha County. I went with a friend and her husband, who had a kayak and a canoe with a 5 HP motor on the back. It was nice having them show me the ropes of my first venture out on to a lake. We got out on the water by 7:20 after a stop for bait at Dicks bait (the old Smiley Barn) in Delafield. I spent the first hour trying to find some decent cover or a place that looked like it held some promise. I ended up in a back bay and hung there for a while. While it looked good, it turned out to be a bust, so I moved on. Finally, desperate for a fish, I hooked up a bobber and a worm and started still fishing around a dock. After a couple minutes, I started getting some action and boated 3 bluegills within 10 minutes. None of them were big, but it beat catching nothing. Over the rest of the day, I caught a few more bluegills and had a nice strike from a largemouth that got away. 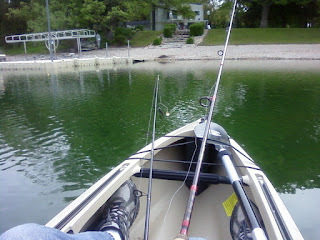 As I said, it was mainly about learning the ropes of Kayak fishing, and what did and didn't work. My Wilderness Systems Commander 120 was a dream come true. It handled extremely well, and tracks surprisingly straight for such a wide boat. I spent most of my time in the captains perch which is the coolest part about the whole boat. Sitting in the bottom seat with my legs straight out gets tiresome, so I would move up to the captains seat and life was good! I had my milk crate with 2 rod holders in the back bay which worked out very well. It was a bit of a pain in the neck (literally) at times, reaching for what I wanted, but I figure once I've tried it out a few times, I'll get a system down for what goes where. 1. It would be really nice to have a cup holder. I know it's "mini-vanish" to want such a luxury, but I want a place to put my stainless coffee mug when I'm fishing. I'll look into a mount of some sort. 2, Standing up and fishing was a bit trickier than I had anticipated. I did a bit more side-to-side rocking than I was comfortable with, so didn't stand for more than 5 minutes at a crack the couple of times I did it. 3. Getting the boat on and off the roof of my 2004 Hyundai, Santa Fe was a piece of cake. The boat is light enough and, because I'm 6'5" I'm able to heft it with little effort onto my Malone Saddle Up Pro racks. They were the best $120 I spent that day at Canoecopia. Easy to install and they grip and hold the boat with no issues. All in all it was a great day! The fishing could have been better, much better, but for a maiden voyage, I was very, very pleased with the way everything worked. The Commander 120 Kayak is a great product!